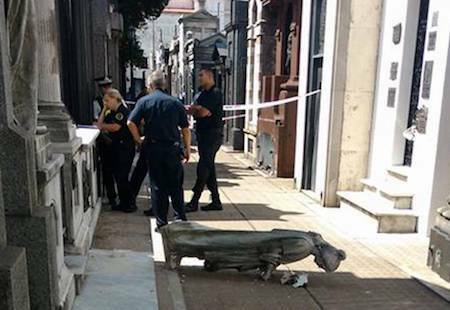 A 30-year old tourist was injured today when he fell along with a statue that he had climbed on in order to take photos in Recoleta Cemetery. Information comes from SAME (Sistema de Atención Médica de Emergencias, the EMTs for Buenos Aires), the Ministry of Environment & Public Space, & from Rivadavia Hospital. Some witnesses who saw the fall said that it happened around 14:00, &, after identifying the young man as a tourist from the Spanish city of Málaga, they explained that the accident took place when he climbed on one of the two marble sculptures that “guard” the entrance to the Pedro de Anchorena vault. “The sculpture separated from its base & fell, taking the young man with it”, informed a city government official who assured that there are signs on-site in the cemetery which state “it is forbidden to climb structures”. 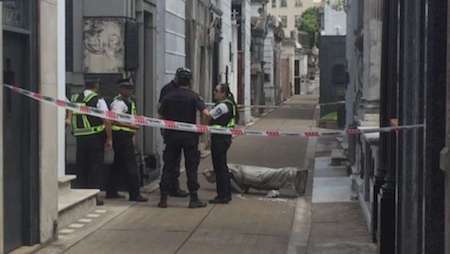 According to city government sources, the tourist “is out of danger” after being immediately treated by SAME, who sent the patient to Rivadavia Hospital for evaluation. “The young man showed early signs of trauma to the thorax & was later evaluated by the emergency room in Rivadavia Hospital”, said the spokesperson for SAME, Alberto Crescenti, just after the accident. The sculpture that fell “could not have done so by itself. That would have been impossible for a statue like that. Someone must have climbed on it”, said Raúl Rivas, who organizes guided visits & is familiar with the cemetery’s architecture. According to the guide, “the aged, white marble sculpture, no more than 1.5 meters tall, is one of two female figures in sorrow with a small bouquet of flowers in their hands that ‘guarded’ the entrance of the Pedro de Anchorena vault, a member of the well-known & powerful landowning Argentine family”. The sculptures that frame the entrance of the Anchorena vault, according to Rivas, have a base that is proportional to the rest of piece, so it “is impossible that it would fall without an external force”. The Pedro de Anchorena vault is located in the Sector 1 of the cemetery, to the left-hand side after the entrance gate & leading to monuments dedicated to Facundo Quiroga & Sarmiento. Marcelo & I struggled to come up with an accurate-but-nonjudgmental title for this post. In the end, this is just one more cultural loss due to stupidity. The accident reminds me of a similar incident in Lisboa last year at the Rossio train station. This should go without saying, but just in case: Please respect Recoleta Cemetery while visiting so its artistic legacy can endure. Photo credits to news agencies Télam & DyN. Esperemos que la estatua sea recolocada en su lugar original. Al menos por lo que se aprecia en las fotos, no parece presentar daños de consideración. Estamos de acuerdo, Luis… y que nadie trepa más estatuas en el cementerio!! Saludos!